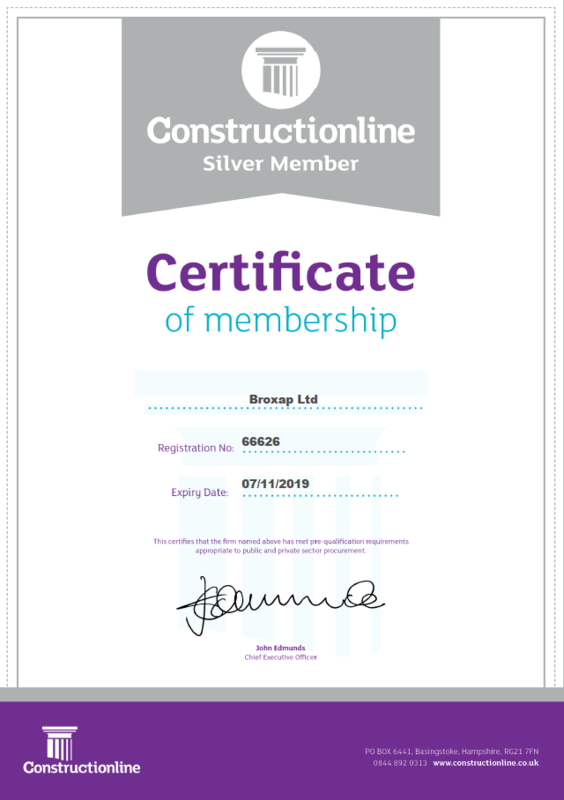 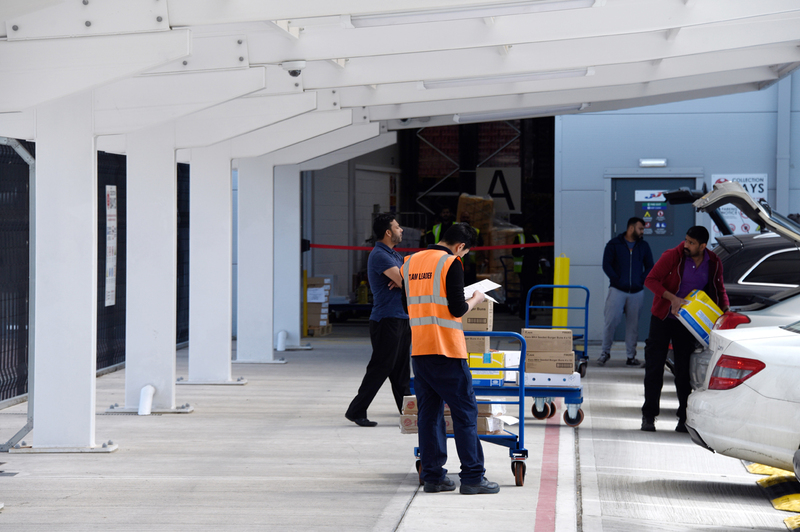 JJ Food Service contacted Broxap to discuss requirements at one of their eight UK based locations that allow restaurants, schools, hotels, local authorities and others to order food supplies online and then collect from their warehouses the same day. 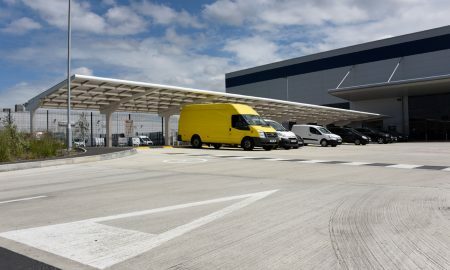 At the Dagenham branch customers would often find themselves packing their vehicles with produce at the collection points outside of the main building; this however was often difficult and uncomfortable during persistent rain. 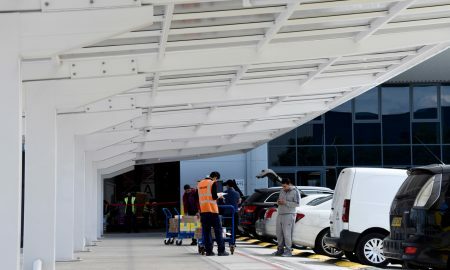 Produce would get wet not to mention the customers and meant the collection period was not the best experience on those days. 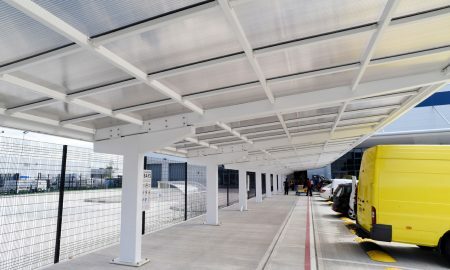 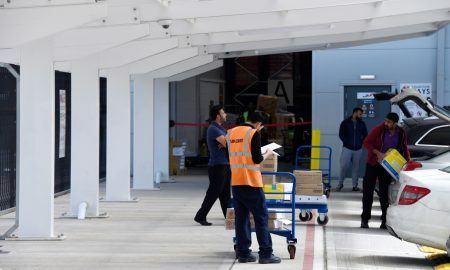 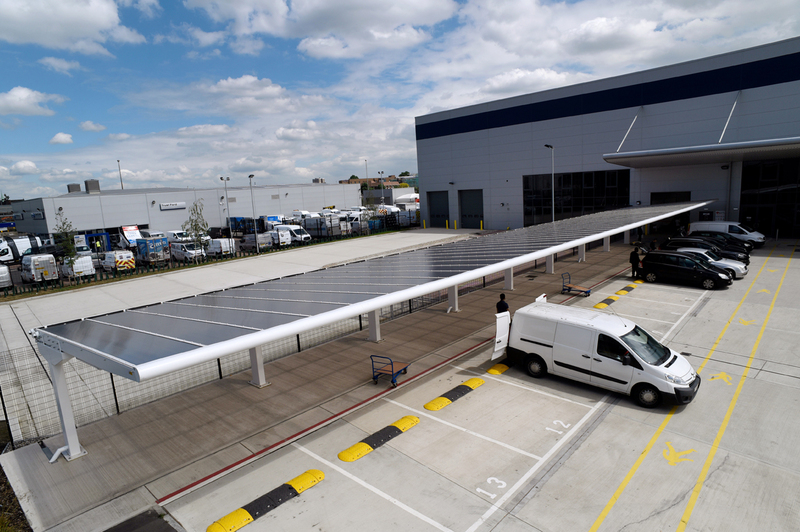 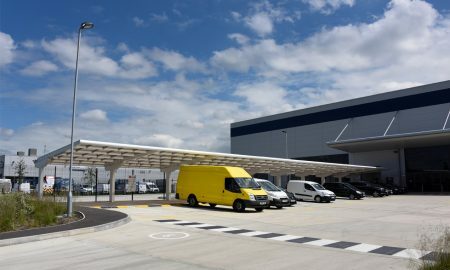 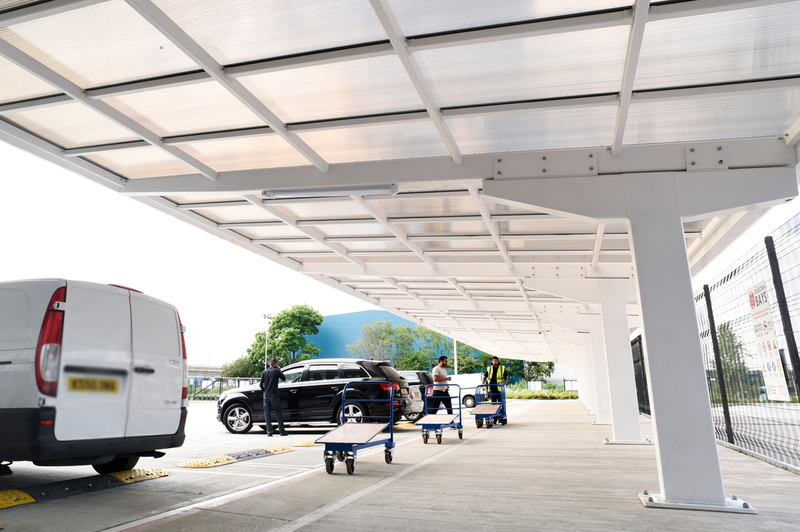 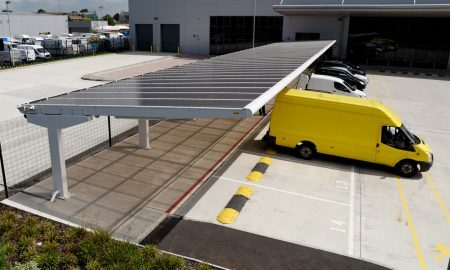 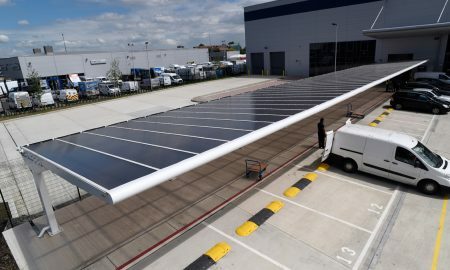 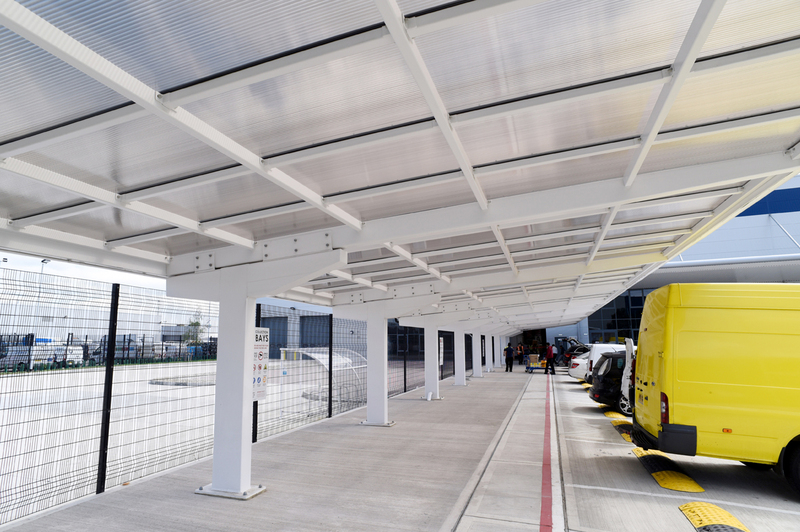 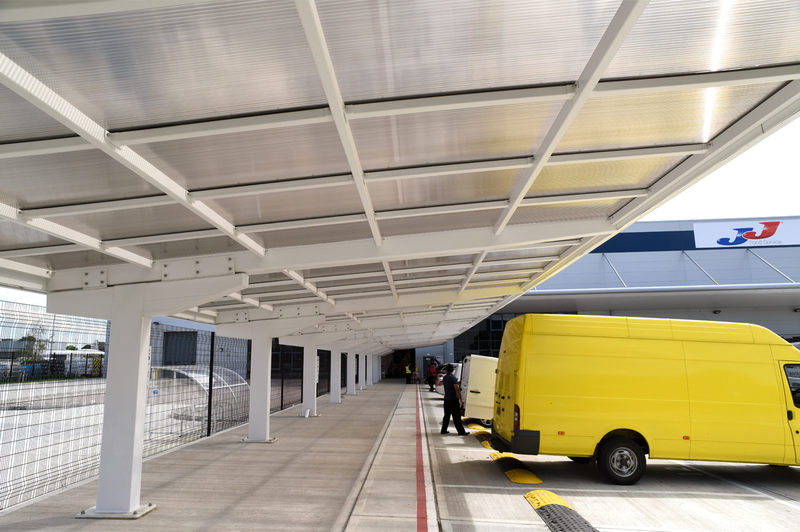 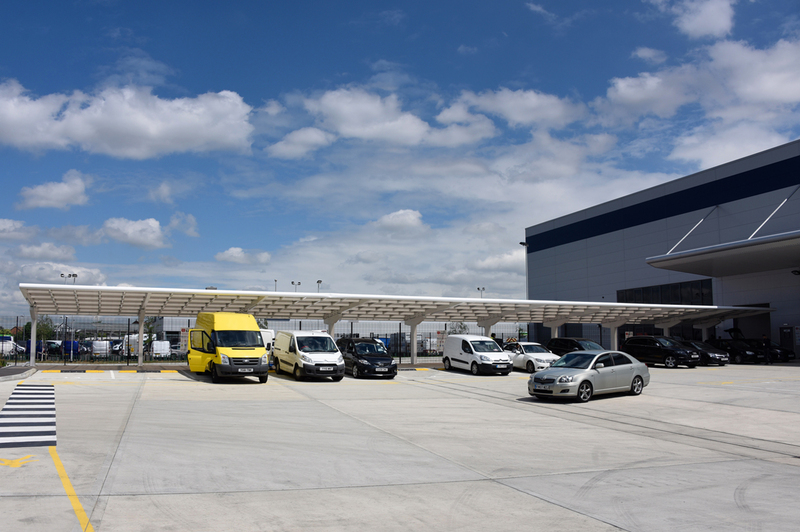 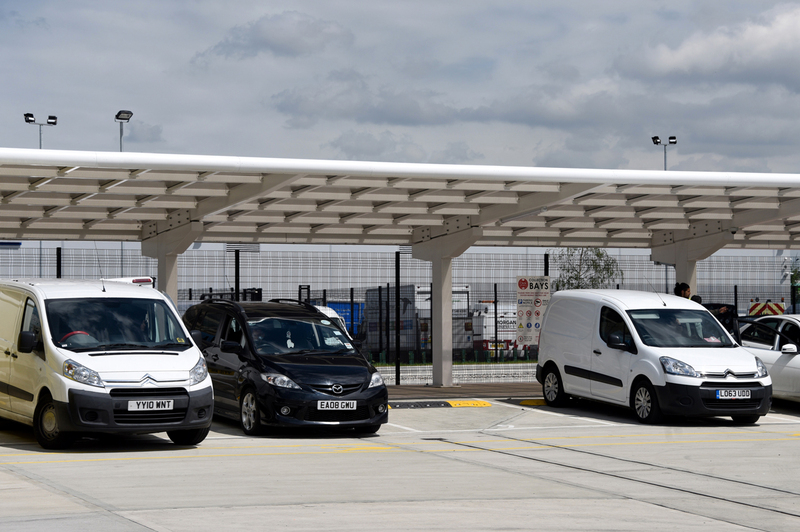 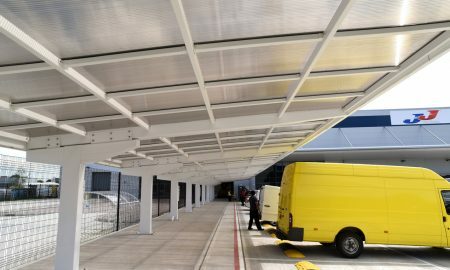 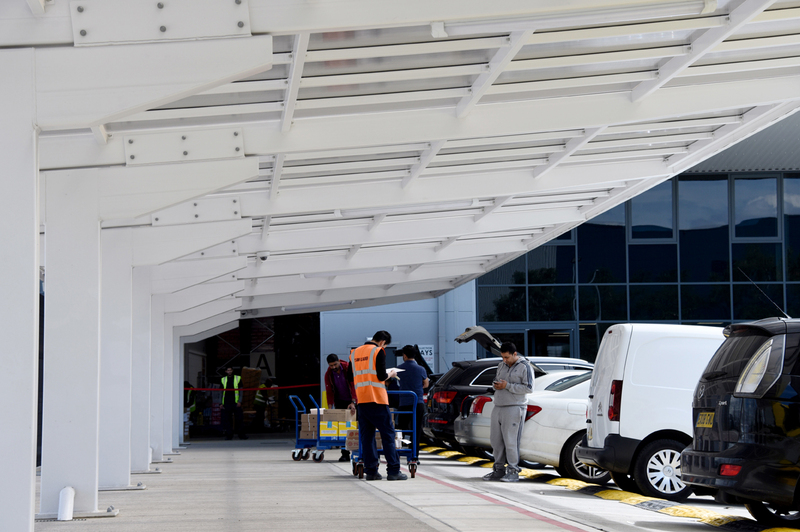 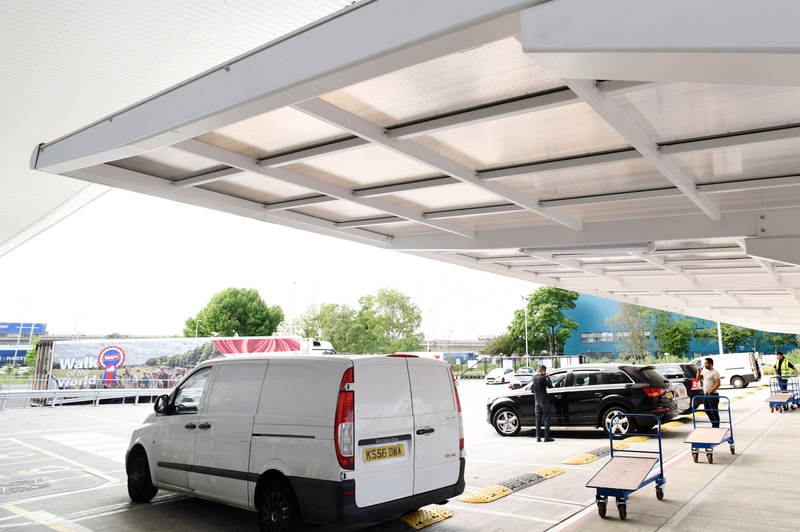 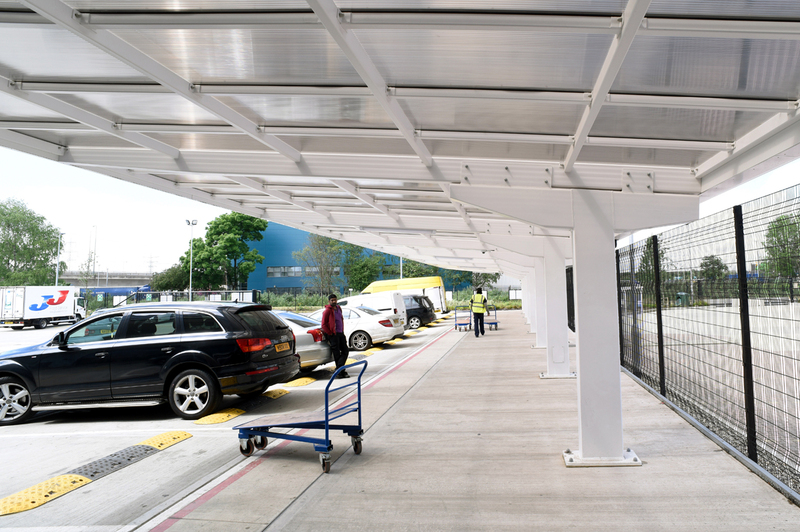 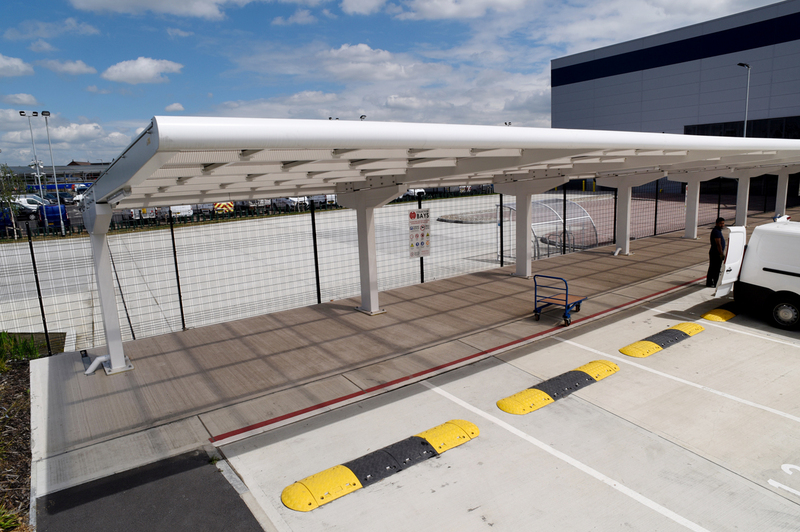 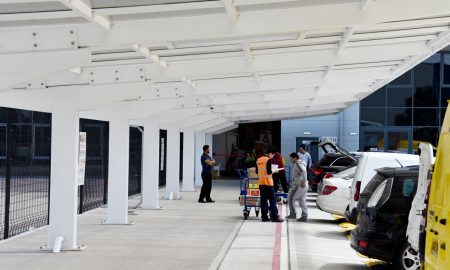 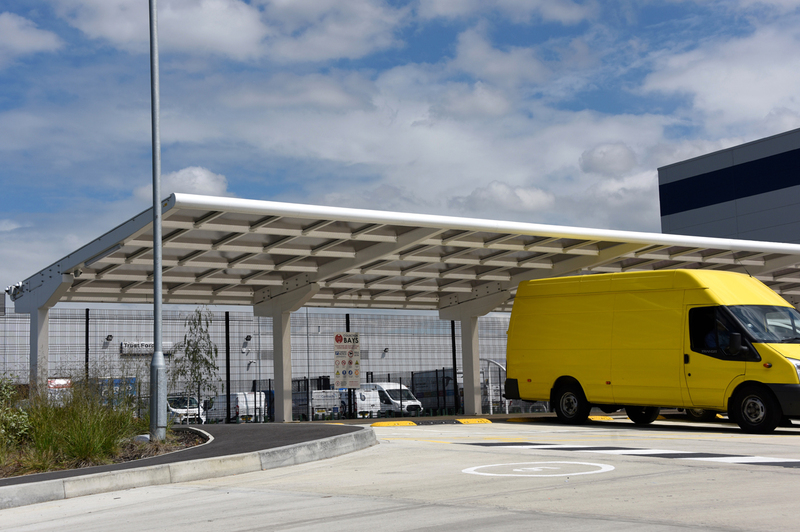 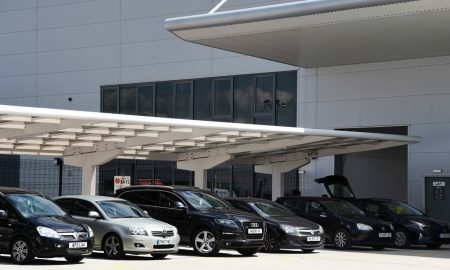 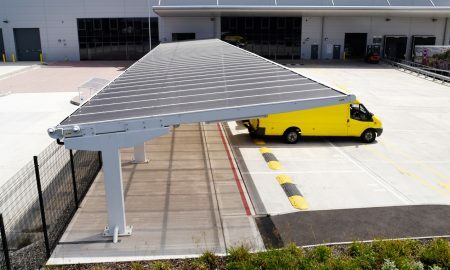 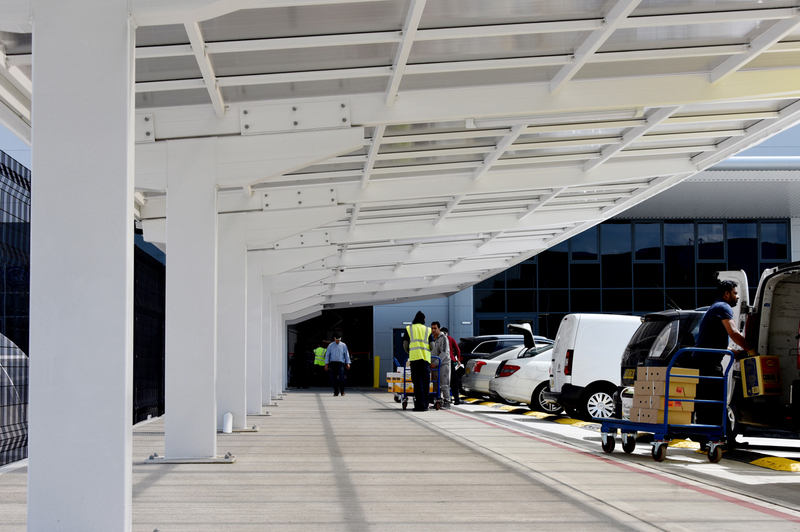 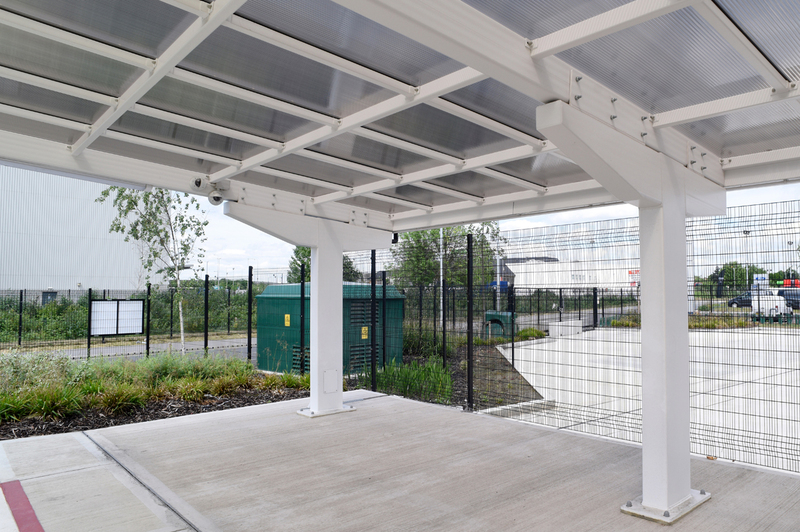 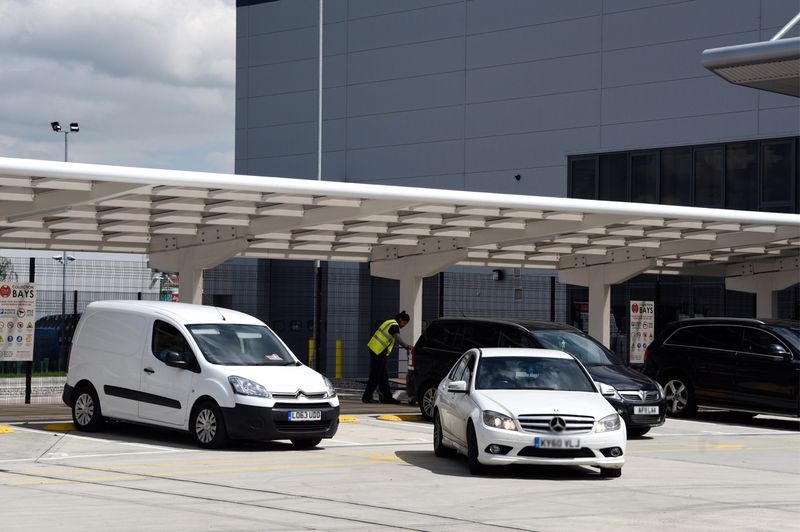 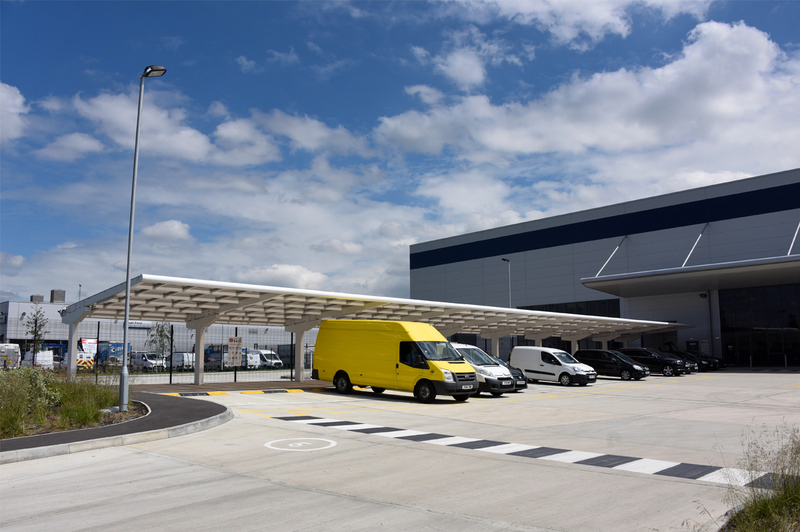 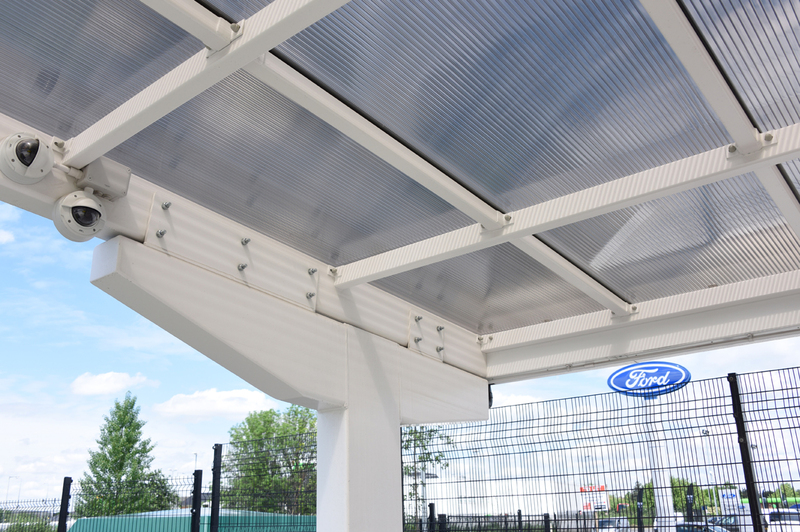 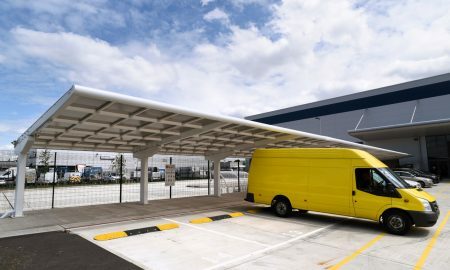 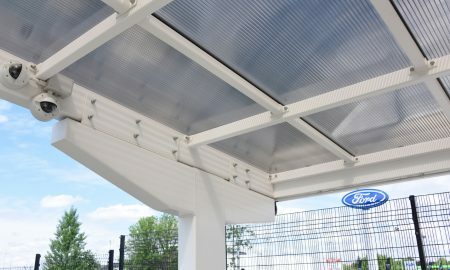 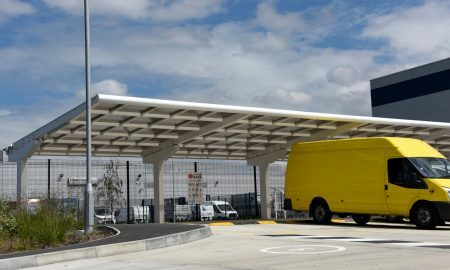 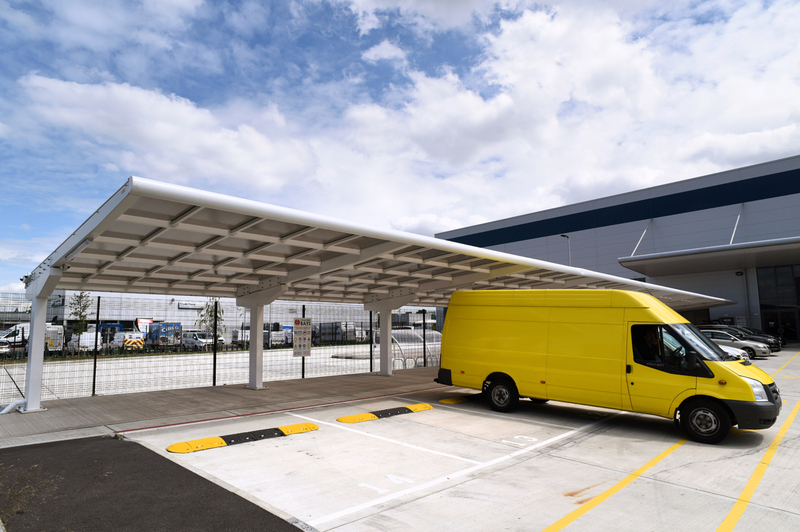 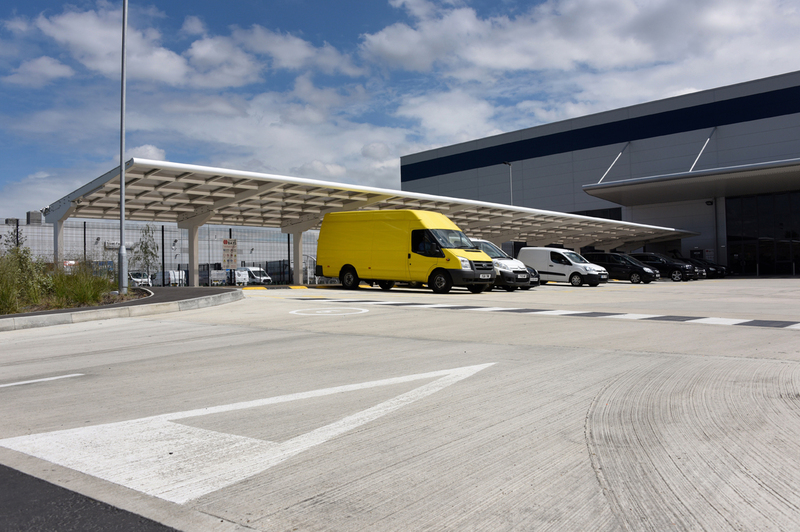 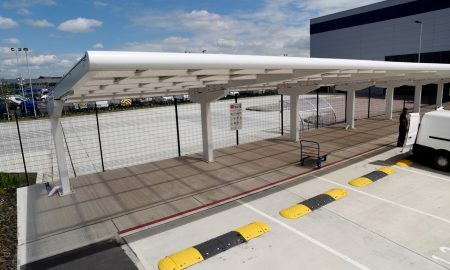 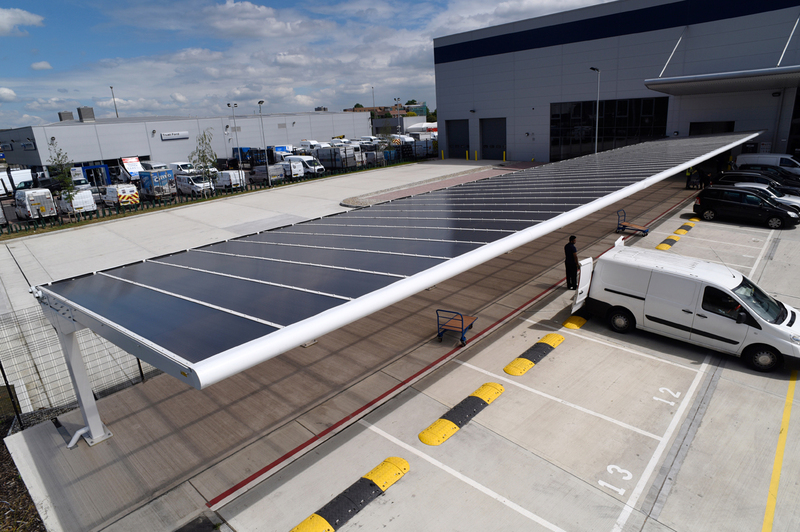 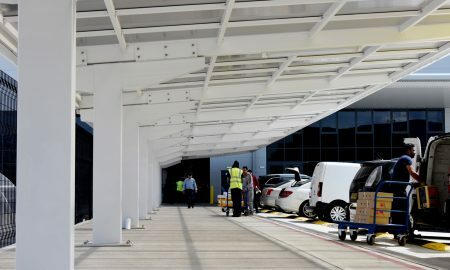 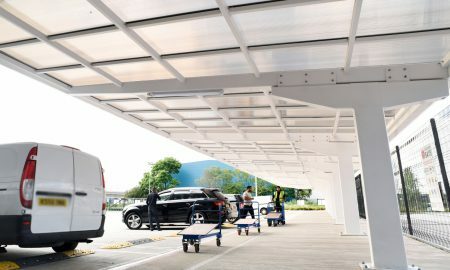 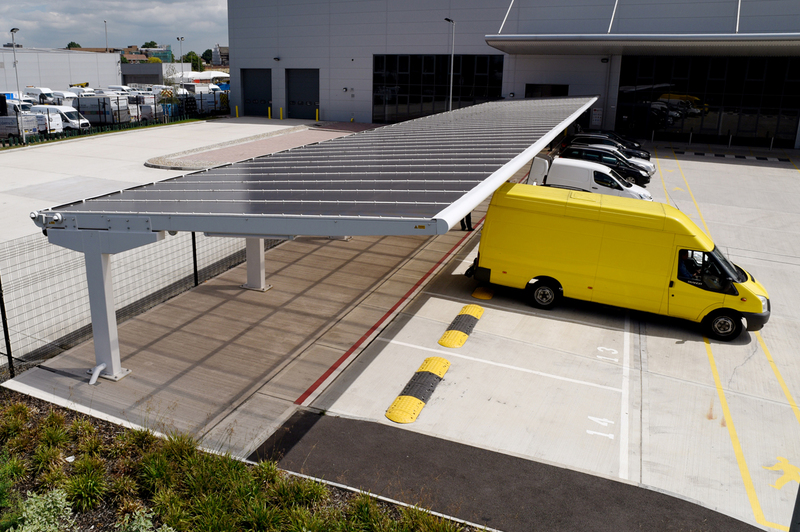 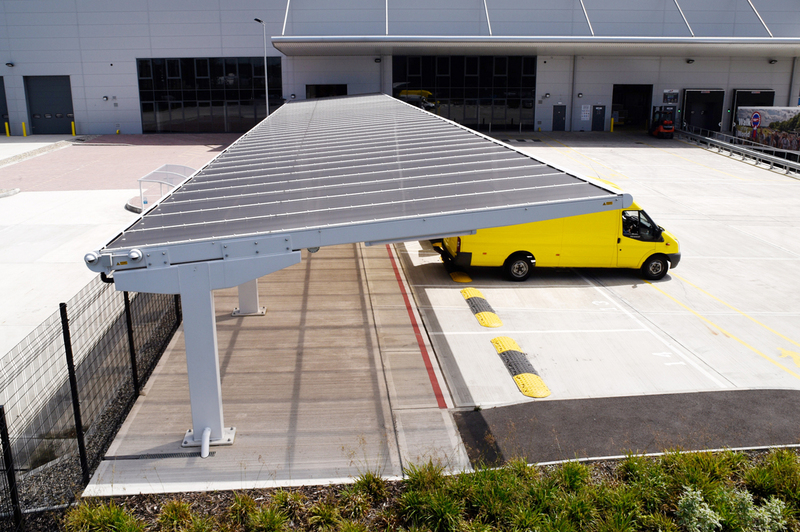 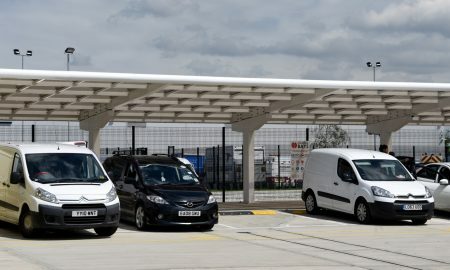 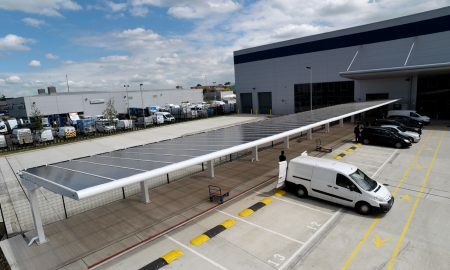 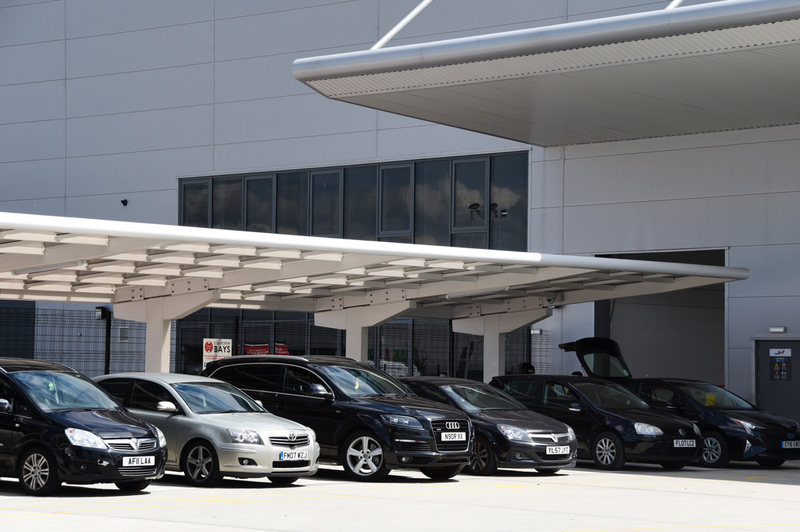 To enhance customers collection periods JJ Foods asked Broxap if it was possible to design a large contemporary style canopy that would span the collection bay areas (44000mm in total) to allow customers to park in the bay and load their vehicles protected from the rain. 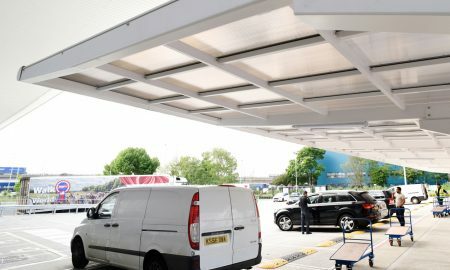 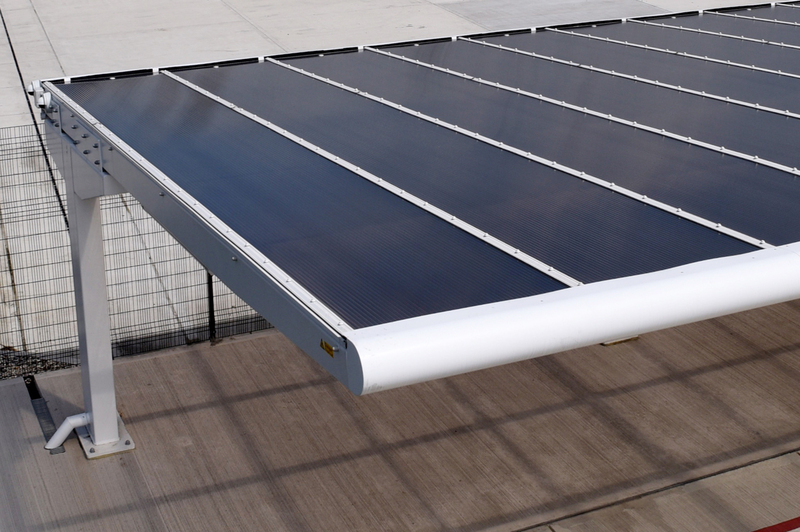 Broxap designed this bespoke cantilever canopy (44000mm long x 7000mm wide x 3311mm high to front/2698mm to rear) with 16mm structured Multiwall Polycarbonate and integral guttering at the rear to collect rainwater and pass to a down pipe within every third column where it is dispersed into drainage at ground level. 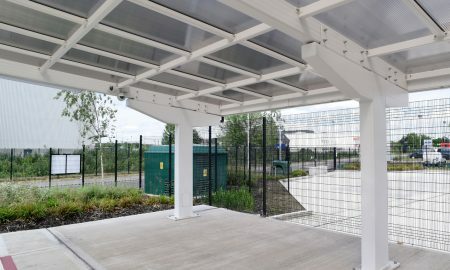 CCTV was installed at the far side of the shelter to monitor collections by customers and vehicles manoeuvring up to the collection points. 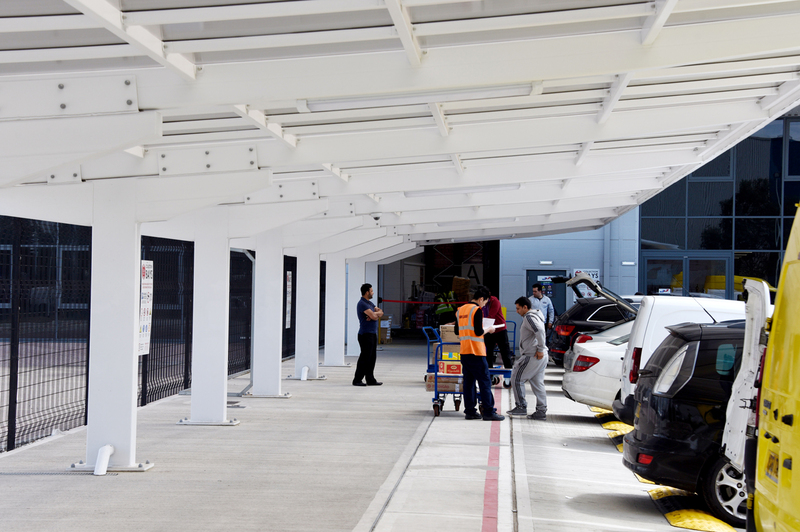 The result is a fantastic looking addition to the main building which has given customers a much improved collection experience.